Flying economy to the USA is one of my least favourite things to do, especially flying with kids. Actually, our girls are fantastic flyers, it’s more Craig and I that get distressed by the discomfort and lack of sleep on such a long flight. If I had the means, I’d fly business class every time. Kalyra keeps begging me to fly business class so she can enjoy a taste of celebrity life. It’s totally her style. I’ve given her advice on how to become a vlogger so she can make it happen herself one day. We were happy to be starting our America Unplugged journey by flying to Hawaii first. 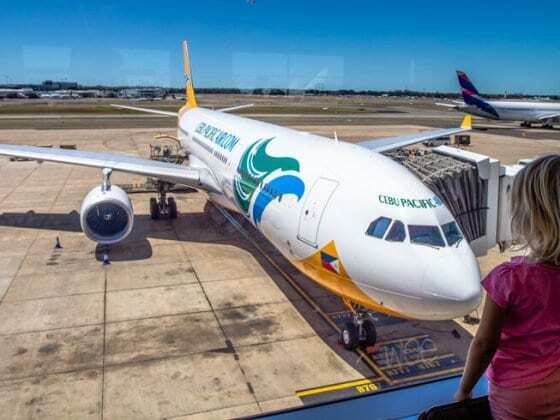 It was giving us the opportunity to break up the never-ending long-haul flight from Sydney to LA. 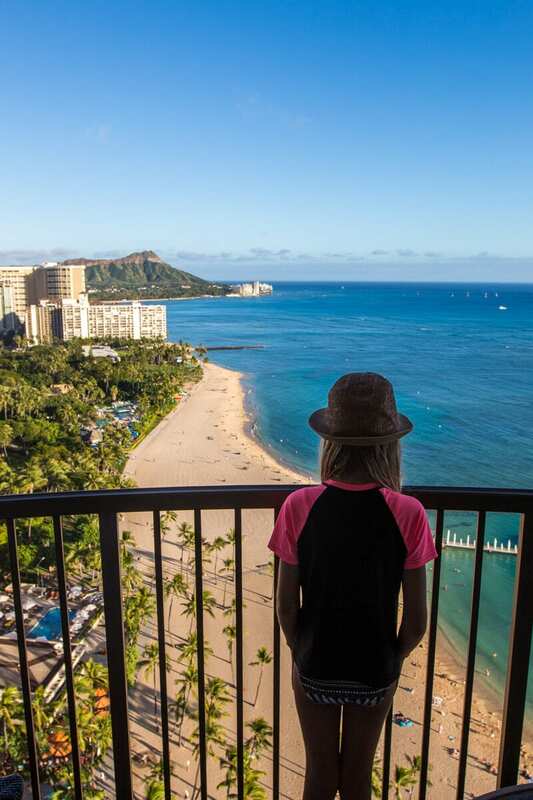 It was also our chance to have a little “holiday” before we start the grind of nomadic road trip travel – I’m not sure you can call what we do a holiday, but it came close in Hawaii. 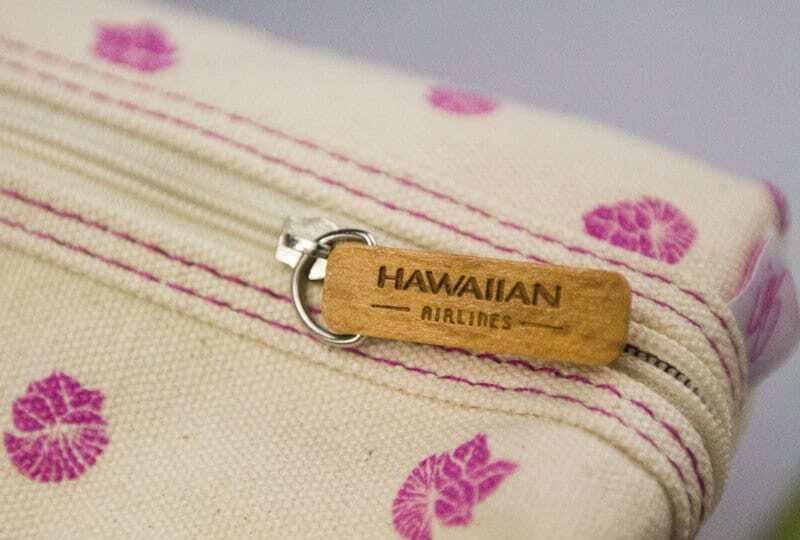 We were thrilled to partner with Hawaiian Airlines on our trip to Hawaii and then onwards to the mainland. 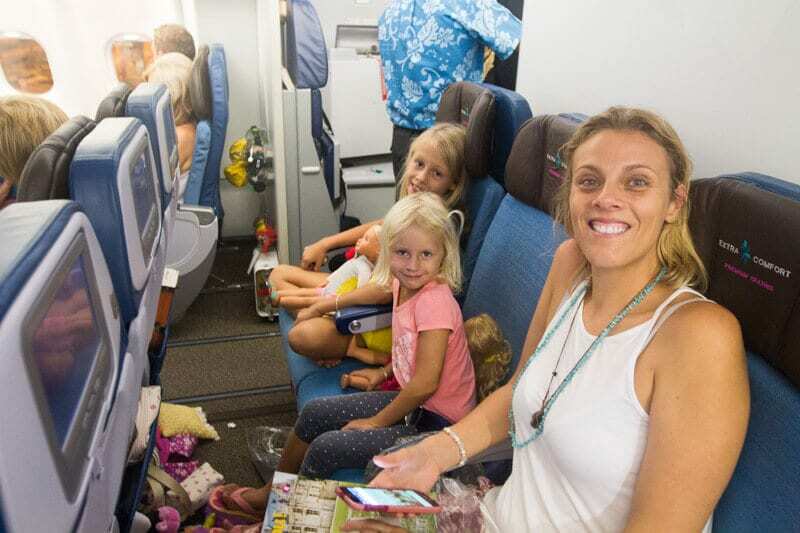 It was our first time flying Hawaiian Air and we were keen to test them out so we could share with you another option for your flights to Honolulu from Australia, then from the Hawaii Islands to the mainland. After flying to Hawaii with Hawaiian Airlines, I can confidently tell you they are my new favourite American airline and rank high on my list of favourite global airlines. Flying from Sydney to Honolulu we had the opportunity to experience their Extra Comfort seating and the perks that come with them. 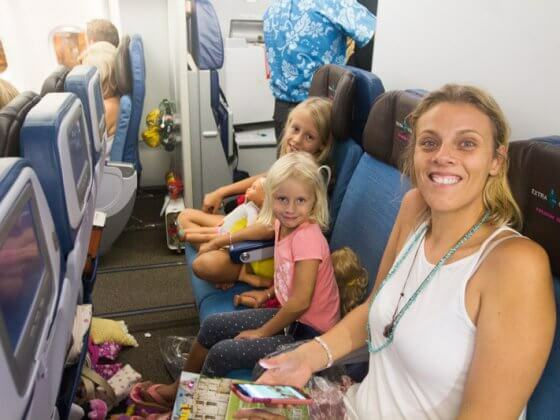 Kalyra was thrilled and both girls have exclaimed that Hawaiian Airlines are one of their favourites too. What is extra comfort seating on Hawaiian Airlines? Extra comfort seating is a premium product for flights on Hawaiian Airlines. It gives you a taste of business class flying without the huge expense. As I write this post on a domestic flight across the USA to get to North Carolina seated in economy, memories of the extra space and comfort is more appreciated than ever. I’m squishy squashed on this flight wishing I had premium seating on Hawaiian again. The premium movie options are great. The girls were ecstatic to have Trolls to watch. They watched it twice and then continued movie runs until I woke up and gave them a stern word about the importance of sleep and how they’ll ruin their first day in Hawaii. You also get a pillow and blanket and amenity kit. It’s one of the best ones I’ve received and I now use it for my makeup and personal items. You can continue the privilege experience in Honolulu with passes to jump the security queue when returning home. If you are concerned about missing your chance to grab an extra comfort seat, Hawaiian Airlines have just expanded this seating on all Airbus A330 aircraft from 40 to 68 Extra Comfort seats. And what I also loved about these seats, is that they had their own separate section on the plane with only three rows of seats. It felt a little more lux having not so many people around you and it’s fantastic protection for your energy field. 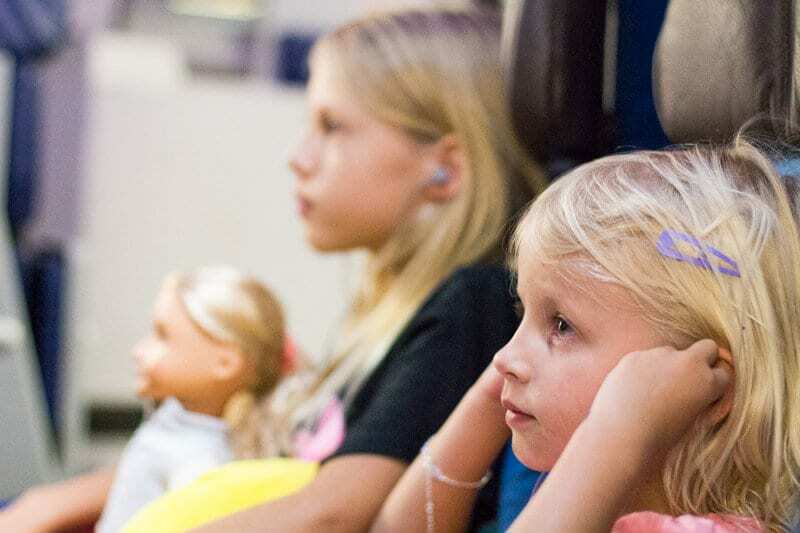 Extra Comfort seating will only cost you an extra $165 upgrade, which we think is worth it, especially when flying with kids. Arriving at your destination with happy, well-rested kids, whose energy fields have not been unbalanced by squashed energy from others, sets your holiday up in a winning way. Now that our trip to Hawaii is over, I know the attentive kindness and happiness of the staff on Hawaiian Airlines is a reflection of the culture you’ll experience upon arrival to Hawaii. They are warm and beautiful people. I’m entranced by Hawaiian culture and wish to return to experience more of it. Aloha is a word that is used to say hello and goodbye but it also means LOVE. It’s the perfect word to describe the spirit of the Hawaiian people. You receive the Aloha service as soon as you arrive on the plane. I was impressed with the smiles and attentiveness and the care and warmth they had when helping my kids. That kind of service is not so common anymore when flying. I’d be happy to fly to the USA via Hawaii any day. When you fly to Hawaii from Australia, the immigration and customs experience is so much easier and nicer than arriving at LAX in Los Angeles and you have friendly Hawaiians greeting you with Aloha. It was then wonderful to arrive in LA and breeze right through as a domestic passenger! 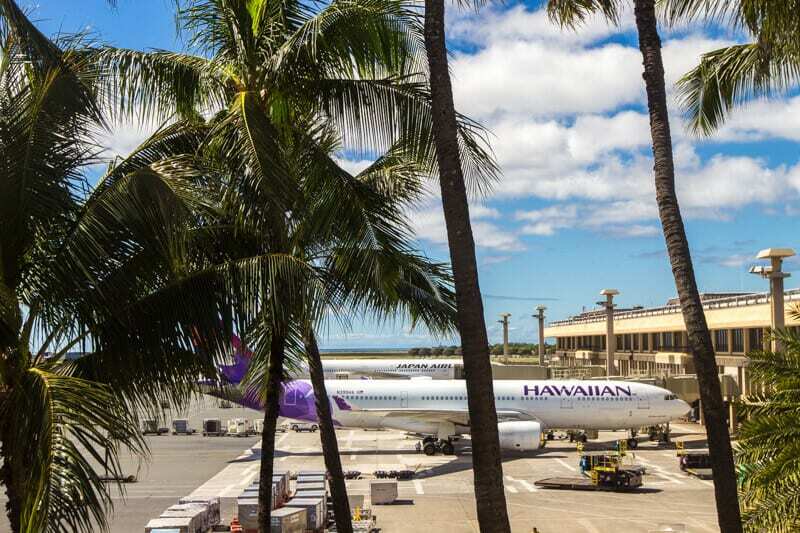 So, if you want to visit the USA mainland, jump on one of the flights to Hawaii from Sydney with Hawaiian Airlines as they can also take you onwards to 11 mainland destinations when you’re ready to leave Hawaii – IF you’re ever ready to leave Hawaii?!! 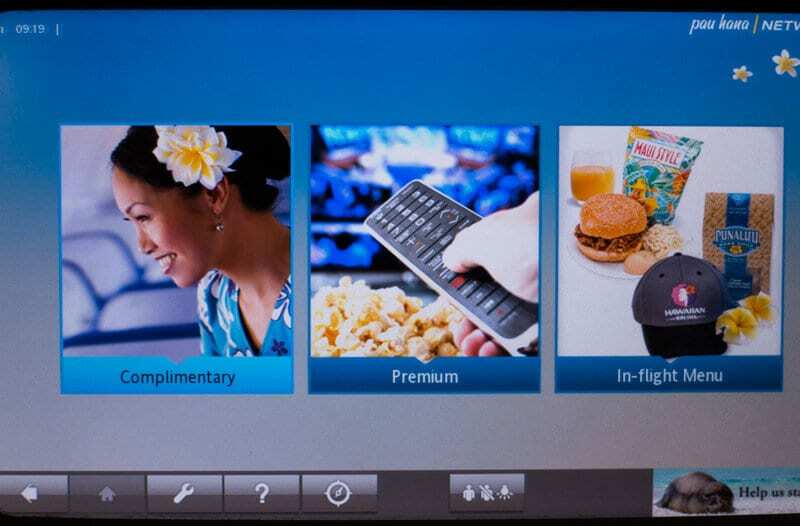 Passengers on Hawaiian Airlines receive complimentary meals and beverages. If you have kids, be sure to pre-order the kids’ meals! What we didn’t like and were disappointed with is that there are no options for gluten free meals. For some, myself included, going gluten free is not a trend; it’s a necessity and a right pain. I’d like to see more airlines catering to people with dietary requirements. It’s quite common that they don’t. The grace for us was that it was a night flight and we prepared ourselves by filling up on yummy Vietnamese soup at the airport before boarding so it wasn’t a major drama. 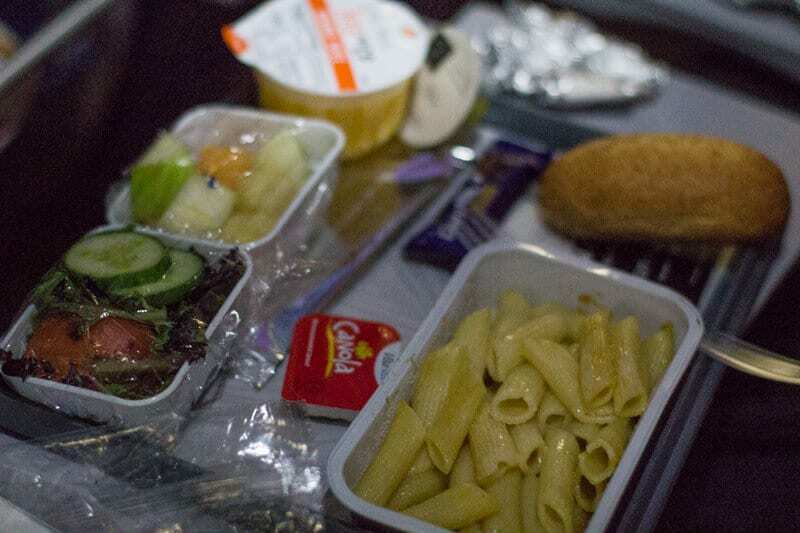 You can bring your own food onto the plane to cover for your allergies. But, I do think it’s time airlines stepped it up in regards to this. It’s the only negative we had about flying Hawaiian airlines. Flights to Honolulu from Sydney depart at 9.20pm and arrive in Honolulu at 10.20am local time. 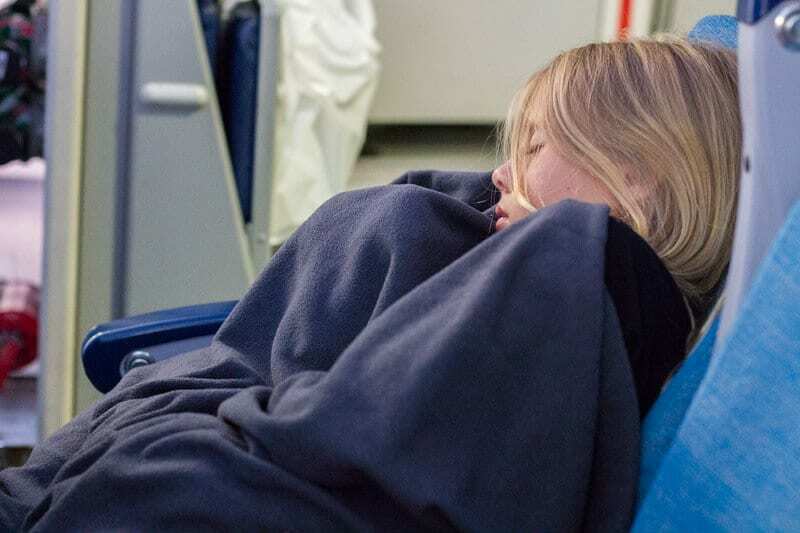 A night time flight is perfect for flying with kids (if they are good sleepers on planes) which our kids tend to be. And being a night time departure versus early morning there’s no crazy panic in the morning getting to the airport on time, you can ease through the day and arrive relaxed. Can you even pack this much luggage? I bet if you travel on Hawaiian Air with your kids you won’t because they get the same amount of luggage allowance. Pack your wallets and an empty suitcase and do some shopping in Hawaii! Each passenger flying Hawaiian Airlines gets 2 x 32kg of checked luggage each. Flying to Hawaii with this much luggage was a lifesaver for us. It saved us a ton of money in shipping stuff over to the US in boxes from Australia. Because we’re relocating to the US for at least 3 years we had more luggage to bring with us than if we were just going on a holiday. We didn’t even use all of it anyway. We had five checked bags of around 23kg each. If you are travelling with children, you can bring the following and be exempt from baggage fees. Heading to the US mainland from Hawaii, however, we had to adhere to domestic flying rules, which is $25 for the 1st checked bag (23kg limit) and $35 for the 2nd because the 64kg luggage allowance is only for return flights between Australia and Hawaii. If you are just going to and from Hawaii, this won’t be an issue for you. We stored our extra luggage in Honolulu with Aloha airport delivery and storage when flying between the Hawaiian islands. It worked out cheaper and easier than checking in our bags and bringing them with us. They offered a good service and are cheaper than storing them at the airport. I look forward to more Hawaiian Airlines flights to Hawaii and tapping into more of that Aloha spirit. Want to see what we did on our Hawaii holiday? Yeah, our kids fly better than us, but the extra room definitely helps on a 10 hour flight. Great review Caz! I love the energy and hospitality of Hawaiian Airlines, especially their flowery uniforms. I also really enjoyed the video and makes me want to go back to Waikiki already! Bargain! I loved flying Hawaiian’s Extra Comfort, though it looks like they’ve improved the amenity kits since I flew. Did you or the girls try the POG juice (passion-orange-guava)? 😉 Hawaiian are well known as the only airline who has the classic drink onboard! Truly seems like a really comfortable fly and an adventurous trip. The clicks are lovely. Good Luck mate! I adore Hawaii! Maui is my favorite island. Have you made it there yet? Any plans? There are some incredible snorkeling spots and wonderful hikes in the rain forest on the road to Hana. And I always fly Hawaiian. They have great customer service and of the many times I’ve flown with them, I’ve only had a single problem, which was remedied quickly. I’m American myself and have been to Australia once. I’m dying to go back because I don’t think I saw all that I wanted to see. I’m so happy I found your blog so I can fill up my “Must-do in Australia’ list. Hope you enjoy your trip to the states! Yes we have been to Maui, we stayed at Ka’anapali Beach Hotel and loved the beach activities and sunsets. And we did do the drive to Hana. We have lots of blog posts coming soon about Hawaii. Glad to hear you also enjoy flying with Hawaiian Airlines. Loved each and every minute details that you wrote down, very informative read. Thanks a ton for sharing. Have a pleasant stay! What row did you sit in? Hi it looks like you were in row 12/13 – did the seats still fully recline with the bulkhead behind you? thanks! 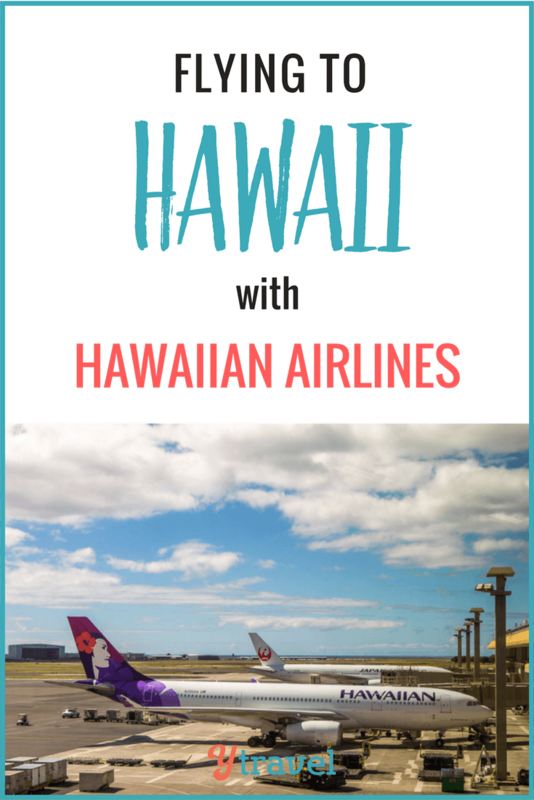 So glad I found your blog on Hawaiian Airlines before we head away! We will be travelling soon with two small children (1 & 3yr old) from Brisbane to NYC (with a 4hr stop over in Honolulu) and have been contemplating upgrading to the Extra-Comfort seats. There are a few options for EC seating on the planes we will travel on, but was wondering if you could help in any way. We have the option of sitting where you were (Aisle 12 behind the bulkhead), but wasn’t sure if the seats fully reclined or if there was more noise being near the hostesses galley/toilets? The other option is being in the main cabin or further back in the plane in front of a bulkhead (Aisle 33), which would give us more leg room, but fixed arms rests. Would love to hear your advice on these seats, if possible, as this is our first long haul trip with the little ones. Hi there , great review , but I’m wondering ..do the arm rests come up on the extra comfort seats?? I understand the bulkhead Extra comfort seats don’t , but what about the others? !